A home cinema is one of those luxuries that film lovers dream about, but if you are fortunate enough to have a spare room, basement or garage that’s sitting empty, a cinema room conversion with a home entertainment system may be easier to install than you think. And the great news is, a home theatre experience isn’t a reality reserved solely for homeowners with the space to turn a whole room into a home cinema. Replicating the experience of a cinema at home is an attainable goal even for those of us with a regular old living room, but of course, the more realistic cinema experience you want, the more changes and commitments you’ll need to make. Take a look through home cinema photos to get some ideas. How do I turn my living room into a home cinema? Sound is the most important element for transforming a TV room into a home theatre. Invest in a quality surround sound system – this can comprise of a number of small speakers dotted around your makeshift home theatre with a subwoofer for boosting the sound. Wireless speakers are ideal for placing around the home cinema without the worry of tripping over cables in the dark. If you’re not working with a large space, a big, widescreen TV could be overbearing, especially if you want to use the room for more purposes than just TV watching, so consider a projector and foldaway screen that will hide your home entertainment system when not needed. With a quality home cinema sound system installed, it won’t matter that you don’t have the built-in speakers of a TV in your new, pop-up cinema room. Good insulation is equally important to fortify sound quality in a home cinema; without the right flooring, door and window protection, your superior sound good might just sound sub-par. Carpeted floors are ideal for absorbing sound, but if your living room has wooden floorboards cover them with a large rug to minimise reverberations. Heavy curtains will do a similar job on windows and if you can, replace flimsy doors with heavier alternatives such as fire proof doors. It might sound extreme, but we did say a home theatre would require commitment! What furniture does my home cinema need? Furniture for a cinema room should be minimal, comfortable and functional. Chairs and sofas you can sink into are a must, and the beauty of this room is that you can introduce home comforts such as throws and cushions to the cinematic experience of your home theatre. Or, you can go the whole hog and invest in some real cinema chairs so it will really feel like you’ve stepped out of your own home and into the cinema – either revamp some original cinema seating, buy new ones, commission your own design or adapt some regular chairs to become your chosen comfy home cinema seats. You may want to keep the room free of distractions if you’re choosing a full home cinema system and installing it in a dedicated home theatre room, with only TV stands or media cabinets to house your DVDs, DVD players and sound systems. If you choose to wall-mount your TV or projector screen, avoid giving yourself a crick in the neck by keeping it at roughly eye height (when seated) – unless your sofas are particularly high, this may rule out a TV above the fireplace. How should I decorate my home cinema? The thing about sitting in the dark is that, well, you can’t see much! In a dedicated cinema room or home theatre, decor can be kept minimalistic. Opt for black-out curtains on windows and keep colour schemes muted and neutral. If your living room is doubling as a home cinema, be aware of glass or shiny surfaces around the room such as picture frames, mirrors and coffee tables that can reflect the screen and create a distraction. If you’re struggling to work out how to put together your perfect home theatre room or space, consider contacting home cinema specialists who can design and install bespoke home cinemas. Even if you don’t want to go for a full renovation, they’ll be able to give you advice on acoustics, projectors and how to create the right feel for a home cinema. 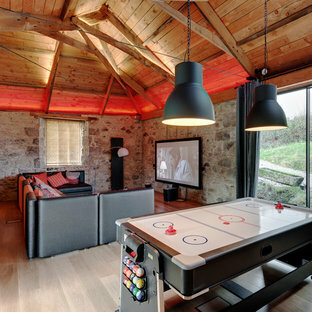 Taking home design to a new level with this unbelievable cinema and games room. 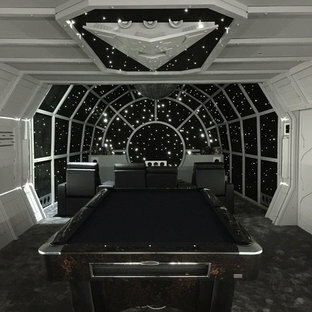 Star Wars themed, based on the inside of the Millennium Falcon, with 'Death Star' projector. A masterpiece from the team Haresign Bespoke. 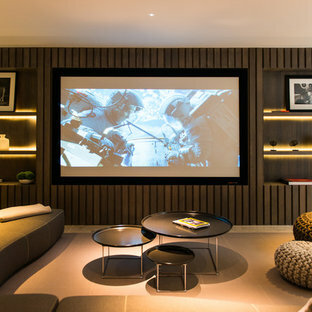 Medium sized contemporary home cinema in London with brown walls and beige floors. Photo by: Camu & Morrison http://camu.co.uk/ This amazing room was designed by the amazing team of Camu & Morrison. 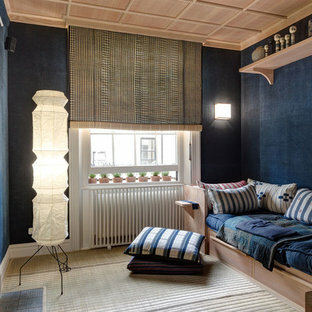 It’s a Japanese cinema room with Tatami Flooring, hand dyed vintage French linen walling, vintage African textile cushions and Home of Wool Tufted Daybed Cushions. We had the honour of collaborating with those amazing professional on a few occasions before. So when they came to us again with a request to create a custom mattress for this project we were very excited to join right away! The daybed here is constructed of 3 equal pieces of tufted cushions filled with our 100% natural wool stuffing. The customer wanted some extra thickness, so we made the cushions at 20 cm each to accommodate that. The other special thing on this occasion was that the customer had chosen a very dark upholstery fabric which he explicitly wanted for the covers. Inspiration for a classic home cinema in Berkshire. Design ideas for an expansive rural open plan home cinema in Devon with a projector screen and brown floors. The home cinema in this new build arts & crafts style property combines traditional design references with contemporary detailing. Built as a reference level Dolby Atmos cinema the installation incorporates Artcoustic Loudspeakers for 7.2.4 surround sound. There are two levels of luxurious cinema seating. A Denon AVR, OPPO Blu-ray player, 120” Screen Excellence screen and a 4k Sony projector form part of the installation. Savant is used to control the projector and audio via one remote and easy to use app. Storage of AV equipment, DVDs and a drinks chiller was achieved through the installation of bespoke joinery, also by Circle Automation. Exceptional acoustic quality within the room was created by the installation of fabric panelling on the walls. 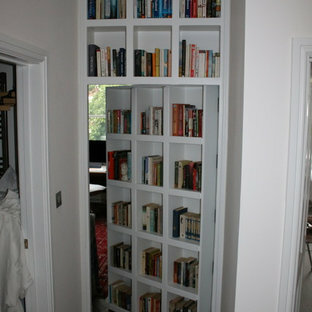 Lighting is also an integral part of this installation. Added depth is achieved through the use of a coiffured ceiling with LED lighting. The client’s artwork and sparkly wallpaper are also highlighted through washing light onto the walls through the positioning of in-ceiling spot lights. 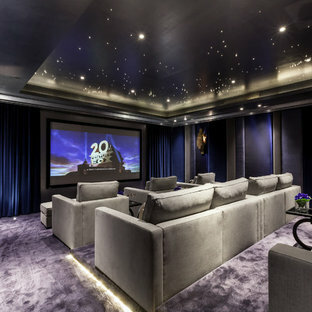 Photo of a modern home cinema in London. Victorian home cinema in London. Design ideas for a contemporary home cinema in London. 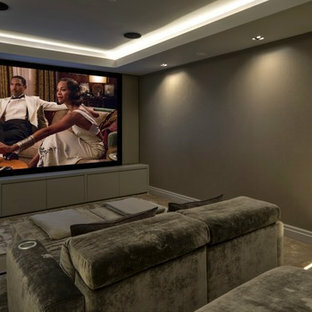 This is an example of a large traditional enclosed home cinema in Other with carpet, white walls and a wall mounted tv. Design ideas for a contemporary home cinema in London with brown walls. Inspiration for a classic home cinema in London with grey walls, carpet and grey floors. Inspiration for a small contemporary enclosed home cinema in London with black walls, carpet, a projector screen and brown floors. 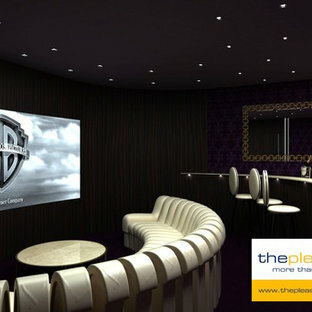 Design ideas for a contemporary home cinema in Cheshire. Photo of a contemporary home cinema in West Midlands.